Shravan Maas is considered by many Devote Hindus to be the most important and auspicious holy month of the year for any kind of Satvik or Pure forms of worship, especially those related to Lord Shiva. This year Shravan Maas started on the 12th of August and concludes on the 9th of September as per the Panchang commonly followed in Mumbai. The true and sincere worship of Lord Shiva is believed to be most effective and beneficial during Shravan Maas or if started during the period of Shravan Maas. Shravan Somwar or the Monday of Shravan is the most auspicious Tithi of this month for worshiping Shiva and the Shivling. On this day many Shiv Bhakts perform a simple Abhishek of the Shivling by offering Milk, Bael Leaves, Durva, Tulsi Leaves, Flowers and a Navedya of Sweets or Mithai. A Puja Thali containing, which normally contains Haldi, Kumkum, Akshata, Coconut, Diya of Pure Ghee and Dhoop are given to the Pujari of the Shivalaya for performing the worship of Lord Shiva and the Shivling. 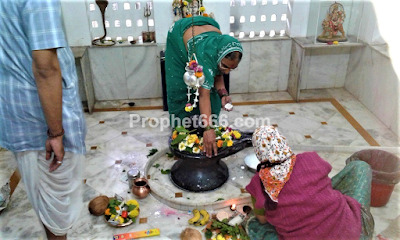 The Pujari chants Mantras of Shiva and offers 108 Bael leaves to the Shivling. This is a very effective ritual for getting mental peace or Maan Shanti and cleansing the body and aura of negative and harmful vibrations and energies. Shravan Maas is also a most auspicious period for starting any new undertaking or enterprise or for any new beginning in life. Apart from some most auspicious Tithis and Shubh Muhuruts, including Raksha Bandhan, Shri Krishna Janmashtami or Gokulashtami also called as Shri Krishna Jayanti falls this year on the 2nd of September 2018. Shri Krishna was was born on the 8th Tithi or Ashtama of the Dark Half or Krishna Paksha of the Hindu Lunar Month of Shravan Maas. Janmashtami is one of the most auspicious Shubh Muhurats of the year for any kind of Satvik Worship, including Mantra Sadhanas and Prayogs for money, business, marriage, job, love or even for the annihilation of enemies who are unnecessarily harassing you and causing problems for you and have become a threat for you existence. I wish to ask one out of the post question. Please answer if possible. Is it like we should not worship lord vishnu and do not water peepal tree on wednesday? बुधवार को पीपल वृक्ष में जल अर्पित नहीं करना चाहिए ,परन्तु विष्णु पूजा का निषेध नहीं है . भगवान् विष्णु की पूजा की जा सकती है.